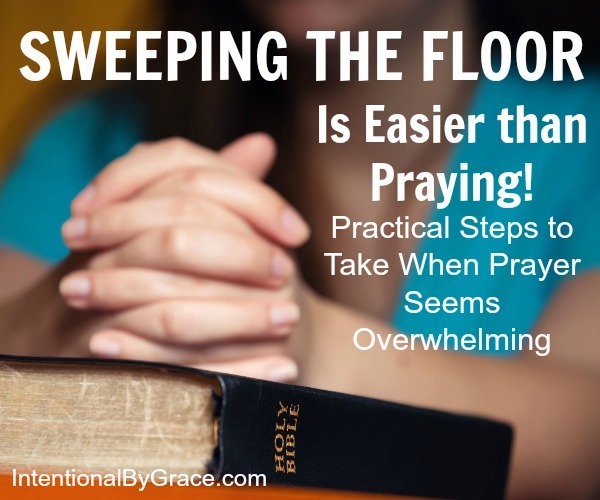 Sweeping the floor is easier than praying. No, seriously! It really is. And sweeping the floor is a really good thing to do. In fact, it is necessary. 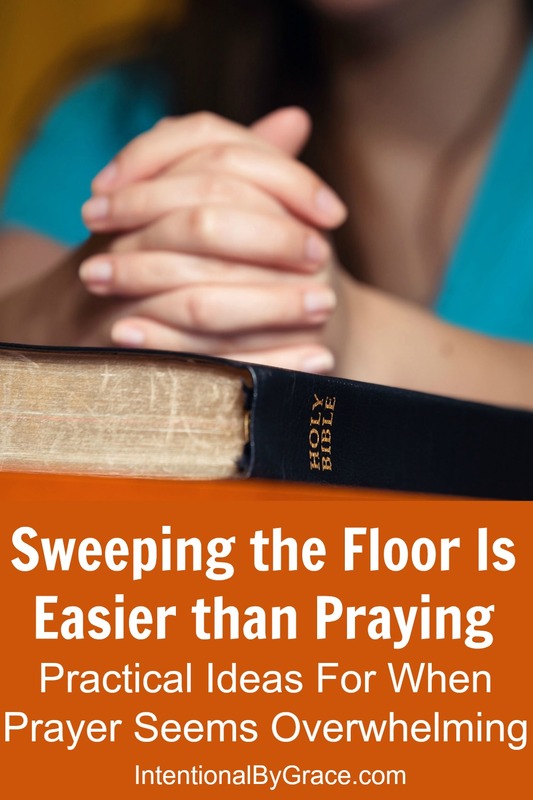 The problem is that sweeping the floor doesn’t have eternal results. At least, not in my house. Prayer, on the other hand? Prayer has ETERNAL results. And yet, I find myself thinking, “I really need to spend some time in prayer today. But this floor needs to be swept. I better sweep first.” And another prayerless day goes by. My life has been spent in frantic activity trying to please You, God. I didn’t have time on top of all that to actually get to know you through prayer. I didn’t take time to acknowledge my weakness and dependence on you. I didn’t spend time confessing my sins and experiencing the joy and freedom of forgiveness. I didn’t prioritize worshiping You. Here’s the reality: The world is falling apart around us. Satan is roaming the earth as a lion, desiring to devour our children (1 Peter 5:8). We ourselves are distracted by the lures of the world. And we are busy sweeping our floors. But, here’s the hope: We can make a difference in our families, in our churches, in our communities, and in our world. This won’t happen unless we are on our knees in prayer, though. 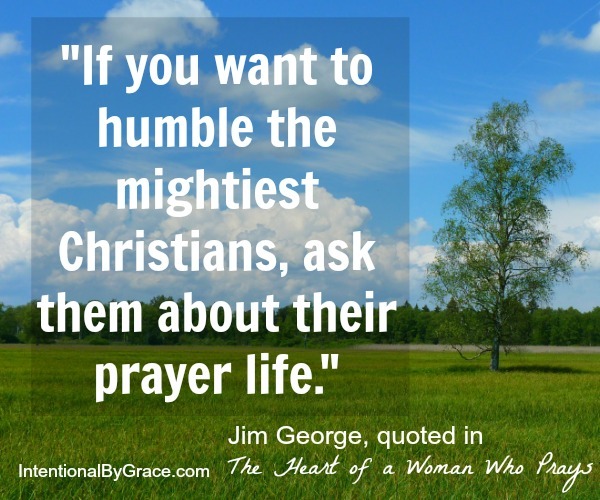 Maybe the thought of prayer overwhelms you because you really don’t know how to pray. I am right there with you! (And so were the disciples – see Luke 11:1-13) Learning to pray is a challenge that takes time and dedication. So, here’s what I am asking you to do today: Commit to taking one or two steps today to make prayer a daily discipline in your life. Commit to becoming a student of prayer. You won’t learn it over night. In fact, you won’t master it in this lifetime. For many years I have prayed without a “prayer closet.” Recently, partly inspired by The War Room, I decided that I needed a place dedicated to prayer. A prayer closet doesn’t have to be anything fancy. My “prayer closet” is a corner of my bedroom between my night table and the wall. It has become a visual reminder to me to pray and a place where I can keep my Bible and prayer board. 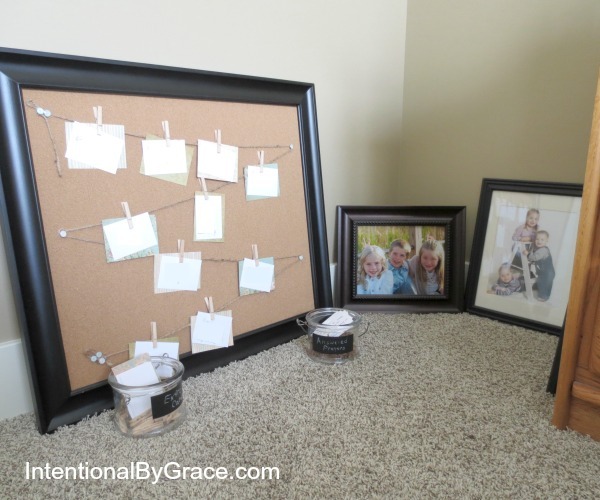 A Prayer Board to keep track of prayer requests. This could also be a prayer journal, a notebook, or a chalkboard – whatever works for you. It is essential for me to keep a written record of prayer requests. If I don’t write it down, I won’t remember it! Peppermint Essential Oil – Completely optional, but it helps me to focus when I am tired. If essential oils aren’t your thing, consider using a favorite candle. Or, skip the scents entirely! Notecards and envelopes -These are perfect to have on hand to write a quick note of encouragement to someone I am praying for. Pictures of my family – They are a huge reason that I pray! A clock or Timer – I am totally ashamed to admit this, but I time myself as I pray. If I don’t set a specific amount of time aside, I tend to pray very quickly, then jump up three minutes later when I remember that the laundry was in the washer overnight and I really need to get it into the dryer. The amount of time is completely between you and God. But, do set aside a definite, realistic amount of time that you want to spend in prayer and then strive to meet that goal every day. 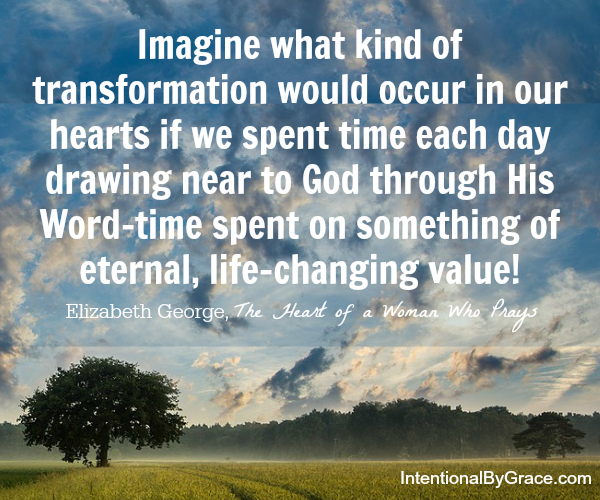 A calendar – In her book The Heart of a Woman Who Prays, Elizabeth George recommends using a calendar to mark off the days in which we meet our goals to pray. At first, this struck me as being too “legalistic.” After all, I don’t want my time in prayer to be just a check on a to-do list. However, having a small calendar and marking off the days in which we pray can give us a picture of how much we are actually prioritizing prayer. It can be a great accountability tool, and one that I am starting to use. Now comes the work and the joy of actually praying! Do You REALLY KNOW How to Pray for Your Children? Finally, if you are ready to take the next step in your prayer life, here are a few books on prayer that have been a huge blessing to me. I know they will be a blessing to you, too! 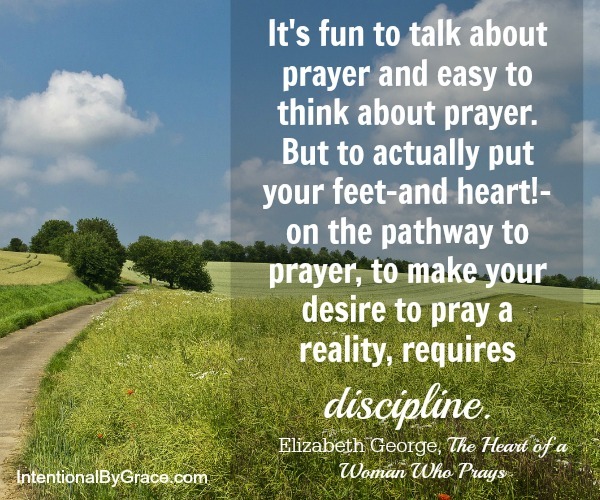 The Heart of a Woman Who Prays: Drawing Near to the God Who Loves You by Elizabeth George: Easy to read, super practical, convicting and Biblical – this book is full of really good stuff. Lord, Teach Me to Pray in 28 Days by Kay Arthur: This book has changed the way I pray. 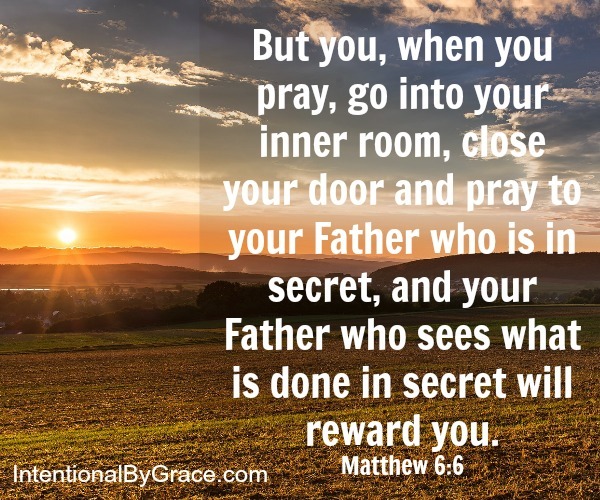 Kay takes readers through the template of the Lord’s Prayer and shows us how our prayers need to be filled with worship, prayers for God’s kingdom to grow, submission, confession, and dependence on God. 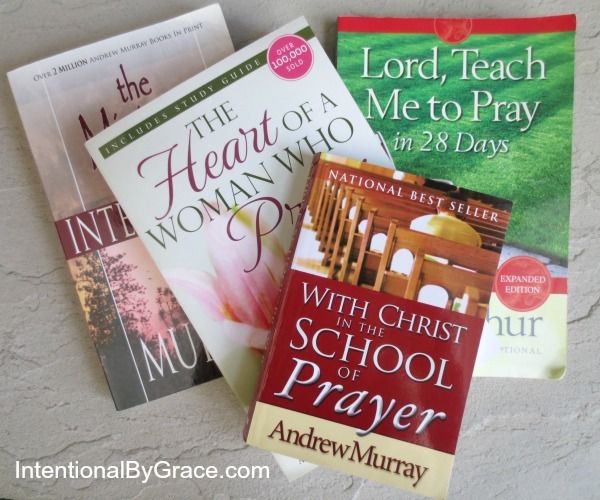 With Christ in the School of Prayer and The Ministry of Intercession by Andrew Murray: These books are filled with serious and convicting theology for anyone desiring to take their prayer life to the next level. These books are difficult to read in both content and style, but oh so worth it! Now its your turn! Which steps will you take TODAY to begin (or continue!) on your journey of learning to pray? Will you be setting up a prayer corner? 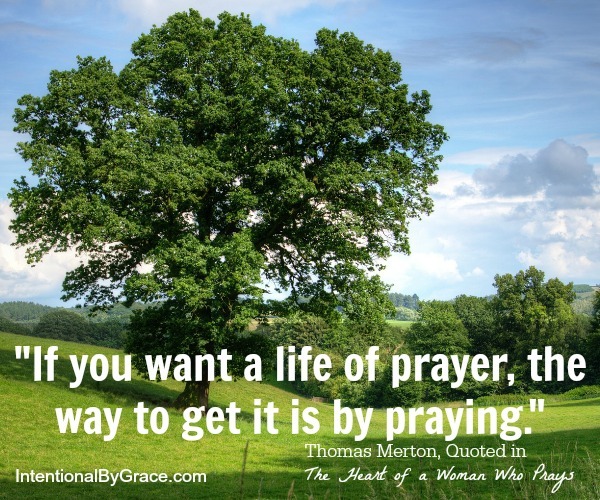 Or committing to spend time each day in prayer? Or learning more about prayer through a book? I would love to hear which steps you will be taking. Scroll down to comment. This post contains my affiliate links. See the full disclosure policy here. It has helped me to be faithful in praying for my children and grandchildren by using Beth Moore’s prayer books, Stormie Omartian’s etc. on my kindle on my I-Pad. I customize them as I pray for each by name. Then I date the page (s) (accountability helps). I usually do this beside my bed. I keep a kneeling pad slid under the bed – which I pull out as soon as I get up to remind me to kneel and pray. Donald Whitney’s Simplifying Your Spiritual Life is excellent at encouraging discipline but not legality – becoming like Jesus. Powerful Prayers in the War Room by Daniel B. Lancaster is a huge encouragement to keep on praying throughout the day. Thanks for these excellent recommendations, Sheryl. I have also really appreciated reading Simplifying Your Spiritual Life. I will have to take a look at Powerful Prayers by Daniel B. Lancaster. May God bless you! Anna Joy recently posted…Mommy, what if God’s not real? The tools outlined in this book helped me learn to focus and keep my prayer time from getting mundane. There are so many wonderful resources! THanks so much for your practical suggestions!